I know, I know, I don’t give enough love to Benefit do I? Honestly, I do like Benefit regardless of past entries! It’s just sometimes they have really miss products that make me want to throw myself on the floor and have a bit of a tantrum (well maybe nothing that drastic!). Some items I’ve purchased from Benefit are absolute gems and one such item would be Dandelion. You need this. No questions. You need it. 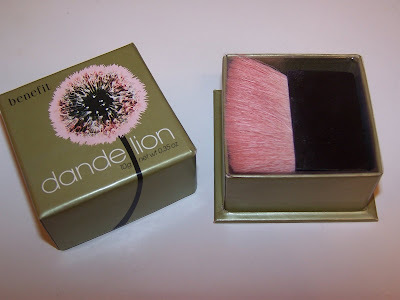 Dandelion has to be thee perfect powder I have come across in this life (and maybe the next). As many misses as Benefit has in my book there always comes along one particular product that they create that I just fall in love with and need with me should I be stranded on a deserted island (Hmmm well maybe I’d need a hot guy too! We can discuss that later though!). 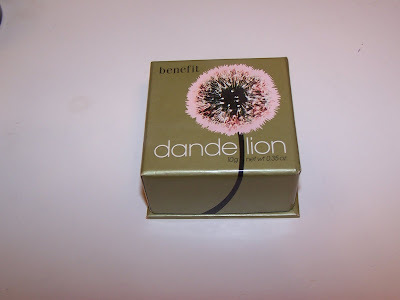 Dandelion, of course, is one of those products that I adore. It’s so difficult to explain this fine powder but I shall do my very best. I can only speak for my own skin tone but this powder weirdly enough, contrary to it’s sheer, rather colorless state within the box, is quite pigmented and actually gives my cheeks a stroke of color that is so very natural and flawless! 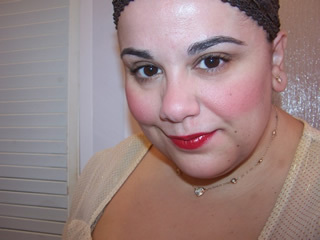 Like I said the powder, strangely enough, is a very sheer pink (with almost a touch of peach). It comes in a cute little box with a strong sturdy brush with slightly harsh hairs (but I still love the brush). You’d never think looking at it that it would pack such a powerful punch. You can use it in one of a few ways. You can stroke it across your face as a finishing powder, you can use it for touch ups, you can use it alone for a pretty flushed look, and you can use it over your blush to tone it done some! I’m positive it has any number of uses and those are just a few ways I’ve used it for! You simply can’t go wrong with this nifty little powder! You’re not the first person that told me it just wasn’t a go with this! and I’m always shocked!!!!!! It’s such an interesting little powder that seems to me would work on most complexions! Go firgure 🙂 Cosmetics are weird critters what works for me doesn’t work for you and vice versa! LOL *pat pat* don’t worry the Muse will make it all better! does dadelion have any parabens in the ingredients/.? I really love this blush! Although, I do believe it is better suited to girls and women with fair or medium-fair skin. I have some friends with tanned skin who I tested Dandelion on and it failed to show up on them (under both artificial and natural light). But for me, it’s the perfect pick-me-up product! 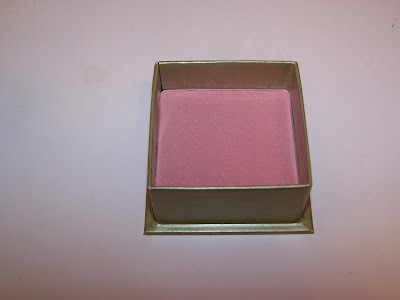 everyday minerals has a blusher called pink ribbon that works exactly like dandelion. just in loose form. i believe its more pigmented too! I just ordered that! I hope it’s a dupe. I love Dandelion so much but really can’t afford to shell out almost $30 for it, even if it does last forever. I tried searching around but couldn’t find an answer. I’m not sure if it does or doesn’t have parabens! So sorry! If you find out do let us know! Aw 🙁 poo! My sister is darker than I am and it quite looked nice on her 😉 But I imagine it isn’t suited to everyone sadly! It’s perfect for me too! I love this stuff! I noticed the site no longer has it up and available in full size just in the palette! Hope this isn’t a demise to a great product! This color, although I don’t have it and I’m just a click away from purchasing, reminds me of Fathom from Nars. Fathom is baby pink with a little bit of sparkle but it’s soooo pretty and although it barely shows up on my olive skin I still have to buy it because the faint of it is super pretty! If only it was a notch or two darker. But it still shows up as the faintest bit of highlight! If you love Dandelion try that too 🙂 I can’t wait to try this, tho it probably won’t show up at all? We’ll see. You were absolutely right when you said ” You need this. No question. You Need it”-that’s what exactly what I always thought! It looked quite ordinary to me when I had it in my hands, but when I tried it on my cheeks-believe me, there’s nothing ordinary about it. I love Dandelion so much! Is there a dupe for this blush?